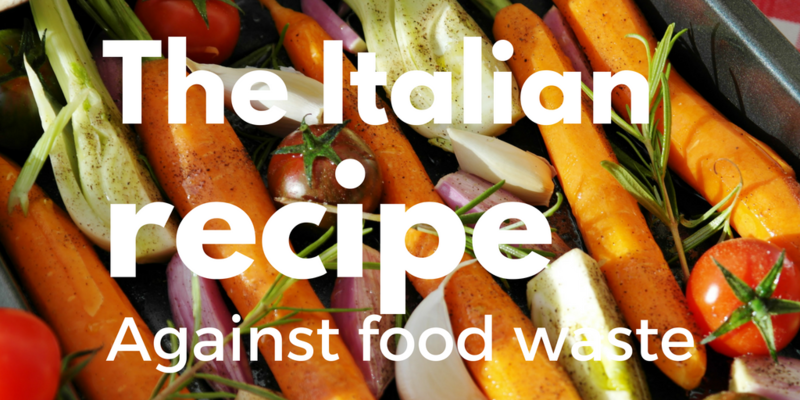 It’s well known that Italian people consider food as one of the “pleasures of life” but maybe what is less known is that Italian consumers waste per year on average over 100 kg, more than their own weight! Promoting the recovery and donation of food surpluses for charitable purposes, using firstly for human consumption, secondly for animal consumption and finally for composting (or composting with aerobic digestion). It, thus, introduces an implicit food waste hierarchy. Minimising the negative impacts on the environment and on natural resources, reducing waste generation, encouraging reuse and recycle, extending products life. The operators of the food sector – both public and private, profit orientated or non-profit– now are able to give away for free their food surplus to the donors, which can then be directed first to people in need, reducing bureaucracy. This is a major step from former legislation that basically “forced” them to throw their surpluses in the garbage. In addition to food surplus, it is possible to give up also medicine and unused pharmaceutical products, foodstuffs and bakery products (which otherwise, if remain unsold have to be thrown away after 24 h from the production). Unlike France, Italy aims in toto for incentives, no penalties are provided for those who does not conform to it. Tax benefits are also provided. In fact, to encourage this practice the municipalities may apply a reduction on the TARI, the Italian waste charge, proportional with the quantity, duly certified, of goods and products withdrawn from sale and donated. Beyond the noble charitable aims of this law, fight against food waste is also really important from the environmental point of view. It is an issue of high importance because of its high environmental impacts, above all related with energy and water consumption, climate change, availability of natural resources, land use and, eventually, waste management. Indeed, if food waste was a country, it has been calculated that it would be the third largest “emitter” of CO2 worldwide, just behind the USA and China! Moreover, 1/4 of Italian forests serve just to absorb carbon dioxide produced as a result of food waste, in Italy alone. Reducing food waste around the world would mitigate climate change effects, according to a recent study made by the Potsdam Institute for Climate Impart Research (PIK), up to 14% of GHG emissions from the agricultural sector could be avoided by managing better food use. In this, Italy is going in the right direction… encouraging best practices, highlighting again the difference between “best before” and “use by” and reaffirming that all food discarded by the food supply chain for commercial or aesthetic reasons (like few packaging flaws), or proximity to the expiry date, are not waste but good food that can be safely consumed! The winning “recipe”, that would be worthy of a 3 stars Michelin restaurant, consists of improving the food chain efficiency, promoting different models of production and, above all, sustainable consumption. This would allow not only a reduction in the cost of food, increasing the possibility of access for lower-income people, but also a significantly lower environmental and economic impact of this wastage!